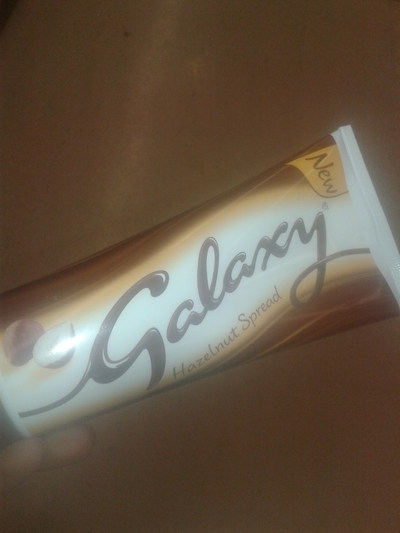 Galaxy have released a new chocolate spread, in a rather unique bottle. It looks like a large toothpaste tube, but with the standard Galaxy packaging. I spotted this new spread in Sainsburys and was surprised to find this amongst the nutella and peanut butters. I never valued chocolate spread, but this new offering from the company, caught my eye. Priced at £1.99, I was curious, doubly because it's not just a Galaxy chocolate bar in spread form, but a hazelnut-flavoured chocolate spread. Naturally, I bought it. It's a thick, spreadable chocolate spread, which comes out of the tube with ease. I added a dollop and spread it on toast and it was delicious. It's a serious contender for Nutella. Although it's a chocolate spread, I can imagine it would work very well on porridge, with a bit of fruit and even in desserts. Admittedly, I don't usually add chocolate spread to dessert, or the mixture of bakes, but the texture and flavour of this spread would make it a perfect addition to brownies especially.